Phil Marsh - The SMU on the running line in late 1997 being shunted by fellow Sentinel Susan. This unusual vehicle was purchased by the Sentinel Trust from the Egyptian National Railway and transported back to England in 1985. It is one of only ten units built jointly by Sentinel and Metro-Cammell, Birmingham in 1951. 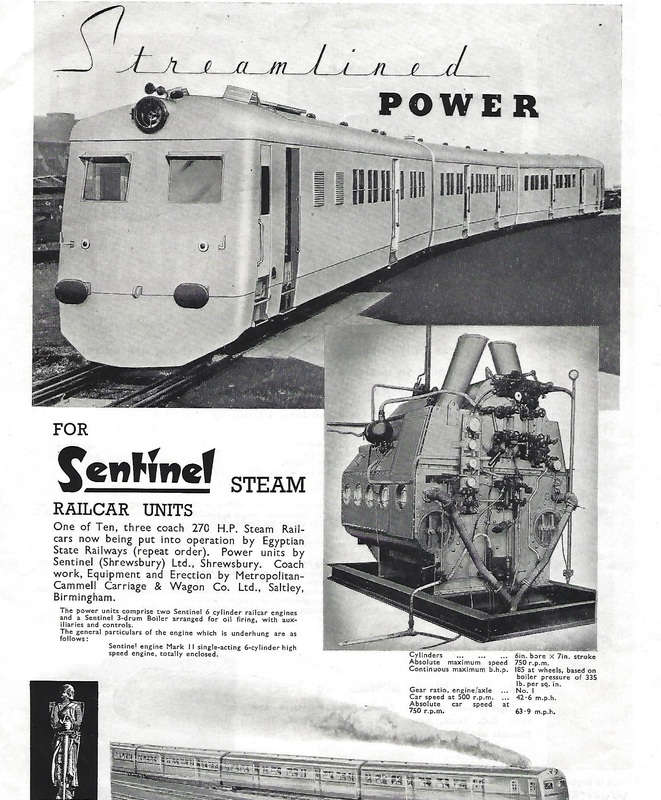 Sentinel constructed the boilers, engines and auxiliaries, which were then sent to Metro-Cammell works at Saltley, Birmingham, who supplied the bodywork and bogies, and where the units were erected. The unit has Sentinel works number 9518. Out of the ten sets built, 7 had been converted to coaching stock, with No. 5028 being in the best condition of those remaining by the 1980's. A previous batch of batch of ten units, works Nos. 9112 to 9121, were supplied to the Egyptian State Railways in 1934. 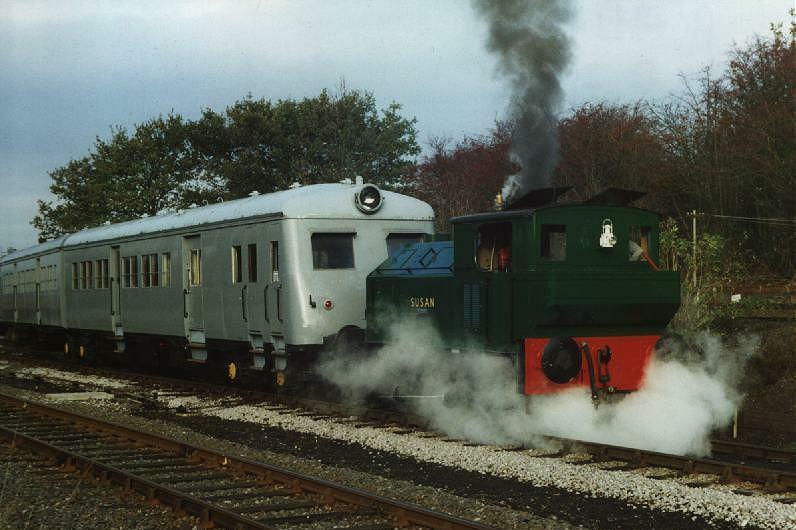 These were twin-car units rather than the three car unit at Quainton. It will be noted that the unit is articulated, the three coaches sharing four bogies instead of six that would be required if normal practice were followed. The boiler is a Woolnough 'three drum' marine type and is oil-fired. It supplies steam to a pair of six-cylinder engines which drive the wheels of two bogies via Cardan shafts. The steam boiler is in one end of the coach (3rd class because of the heat), the middle coach was 2nd class, and the end coach was 1st class. Each coach had a toilet appropriate to the class! Top speed of the unit is over 60 mph and it seats 186 passengers. 5208 was used on Cairo suburban services, based at El Wasta depot, some 50 miles south of Cairo. It also worked around Tanta, 50 miles north of Cairo. 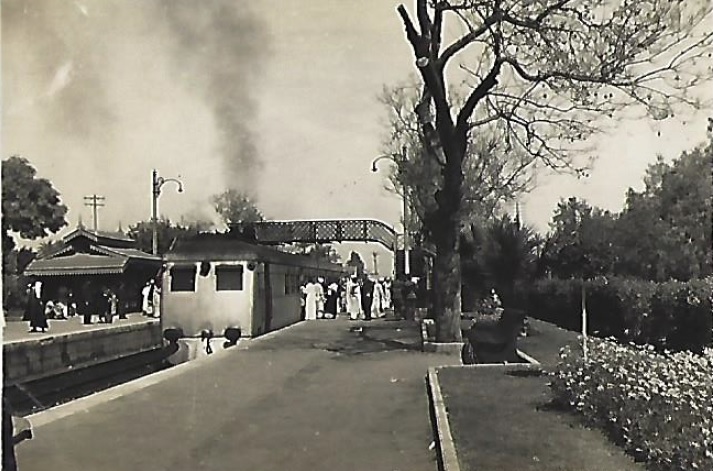 It was withdrawn from service in 1962, when it was put into storage at El Wasta. During September 1984 it was moved to Alexandria on the first stage of its journey home, and it arrived at the Centre during January 1985. It is in good condition considering its long period of storage and it is hoped to return it to working order in due course. During 2005 the ownership of this unit transferred from the Sentinel Trust to Quainton Railway Society. The boiler has had a preliminary boiler inspection, and it is now possible to carry out a hydraulic test to establish the condition of the boiler. Particularly with this type of water tube boiler it is impossible to inspect all the tubes, so throughout 2007/ 2008 the boiler was been stripped down. Early in December 2007 it underwent three hydraulic tests, to a pressure just over the recommended test pressure of 560psi. It has been shown to be in good order. The current main project is the restoration of the first power bogie, with the other power bogie to follow afterwards. Boiler 335 psi three drum water tube boiler. Engine Two 6 cylinder single acting compact steam engine, driving the last and first articulated bogies of the power car. Regulator Housed in the boiler room. Controlled by hydraulics from driving compartment at either end of the unit. Control Notching up of engines by hydraulics from driving compartments. Series of lights to indicate regulator position and notched up position. Boiler Feed Automatic with a float valve controlling a feed water pump. Standby injector. Fuel Heavy Bunker C Oil which is heated, strained, reheated and blown under pressure into the boiler firebox.